I eat a known carcinogen every spring. But then again, chances are, so do you. Few wild plants are as polarizing as bracken fern, Pteridium aquilinum. It is a global species, living everywhere but the harshest deserts and the coldest tundra. Here in California, it is ubiquitous. I find its fiddleheads — odd looking fiddleheads, like an eagle’s clenched talon — in Point Reyes as early as late February and as late as mid-June in the High Sierra. That means if you wanted, you could eat bracken fern fiddleheads for four straight months here in California. You could, but you shouldn’t. And like most black-and-white statements, both are wrong. After a pretty exhaustive — and exhausting — survey of the literature, it seems pretty clear that a typical forager’s diet of bracken fiddleheads, blanched and sauteed with lots of butter (or whatever) is perfectly safe. Before you start shouting at me, let me explain. The primary villain lurking within bracken fern is a substance called ptaquiloside. It is, by all accounts, nasty stuff. 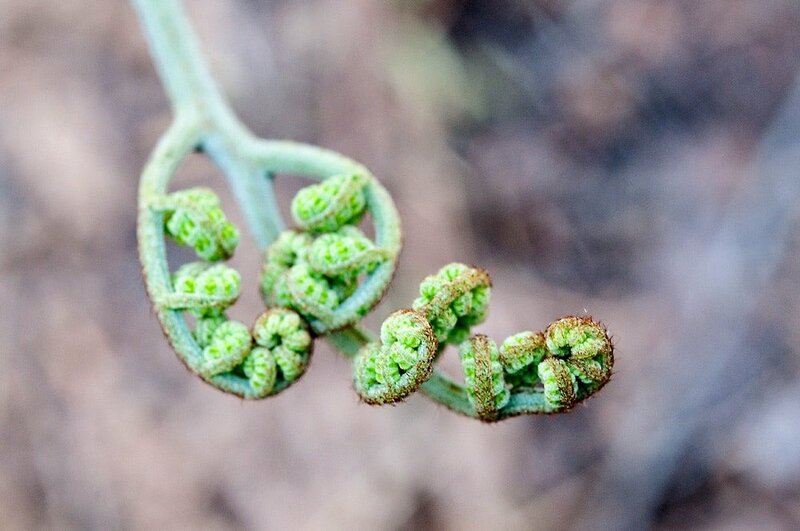 And bracken fiddleheads are packed with it, up to 0.8 percent by dry weight, according to some studies. But therein lies the first caveat: A raft of other studies shows that ptaquiloside levels vary wildly in bracken stands. Some in New Zealand were even found with none of the stuff at all. So you really have no idea how much — if any — of the carcinogen lies within your pretty fiddlehead. It is abundantly clear, however, that if you eat raw bracken fiddleheads in the woods you will probably ingest ptaquiloside. And that’s not good eats. First, it is not actually a carcinogen, according to the latest research. But it is volatile, and likes to react in alkaline environments to create what is now suspected of being the true carcinogen, a substance called dienone. This is why drinking milk from animals that have been eating a lot of fiddlehead fronds is a very bad idea; milk, and the healthy stomach of a ruminant, is basic enough to cause the ptaquiloside to transform into dienone. Second, ptaquiloside is water soluble. That means if you soak bracken fiddleheads in cool water (cool to keep them crunchy), and change that water every so often, you will greatly reduce the level of this nasty substance in the fiddlehead; the Japanese often eat bracken this way. Third, ptaquiloside is notoriously volatile at normal temperatures. The pure stuff degenerates at room temperature, which is why the scientists doing the rat studies store their ptaquiloside at -20 degrees Celsius. Once exposed to boiling temperatures, the carcinogen denatures almost completely. Salt increases this effect. Virtually all the data on the subject link most human health problems associated with bracken fern to exposure to contaminated milk from animals eating bracken, contaminated groundwater near bracken stands, and, in some cases, long-term exposure to bracken spores; so if your yard is covered in bracken fern, you might want to dig most of it up. What all this means is that a very normal cooking process for fiddleheads — blanching in salty water, then shocking in ice water, then sauteeing — renders the fiddlehead close to harmless. Note that I say “close to harmless.” Even though most of the research out there suggests that normal human methods of eating bracken, which, incidentally, has been eaten by cultures across the globe since prehistory, denature or render harmless what ptaquiloside exists in a bracken fiddlehead, there is one nagging piece of data out there: There is an apparent link between chronic consumption of bracken and an increased level of throat and gastric cancers in the populations of Korea, Japan and parts of China. Bracken is widely eaten in Korea, Japan and parts of China. And when I mean “widely,” I mean almost every day in some cases. Bracken (gosari) is a classic part of bibimbap, one of the most famous Korean dishes there is. Most of the research on this has been done by Japanese and Koreans, searching for clues as to why they seem to have high rates of throat and stomach cancer. Apparently there are a kaleidoscope of reasons, and habitual bracken-eating is among them. Like anything, ptaquiloside’s poison is in the dose. According to my reading of the research, the body apparently can process out only so much of the stuff, and constant eating of bracken puts too much in the system, and that’s what causes cancer. I know what you are saying. Why even mess with this crazy bracken thing? Why even put myself at risk? Several reasons. First, bracken tastes wonderful, like asparagus, almonds and Tuscan black kale all rolled into one. Second, eating bracken is akin to drinking alcohol: Done responsibly, it is enjoyable and perfectly safe. But just as you would not rationally decide to drink a case of beer every day for a month, you would not rationally choose to eat a big plate of bracken ferns every day during the fiddlehead season. I choose to eat bracken fiddleheads. How often? Maybe a half-dozen times a year. Eat them once and you will see what all the fuss is about, and make your own decision. Just remember your Aristotle: All Things in Moderation. 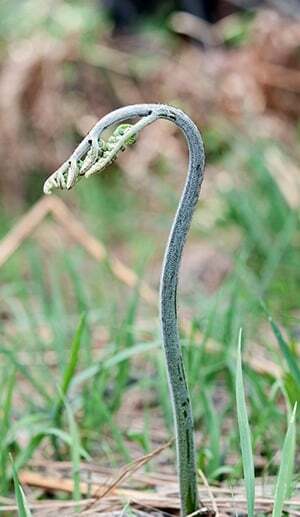 If you do pick your own bracken fiddleheads, choose those that are not fully extended. You want them either in the horseshoe bend or at least tightly closed. Remember, the eagle’s talon should be clenched, not open. Do not eat them once their fronds unfurl. Bracken fern is as tasty eat as it is beautiful, but you need to take some special steps in cooking it to diminish its harmful properties. Once you do this, it is best to just simply cook these pretty things and enjoy their flavor, which is a combination of asparagus, almonds and kale. Truffle butter seemed like a natural choice as a flavoring — regular butter and truffle salt is a good alternative. No truffle products? Just use the best butter you can afford and a nice fancy salt. Splurge! 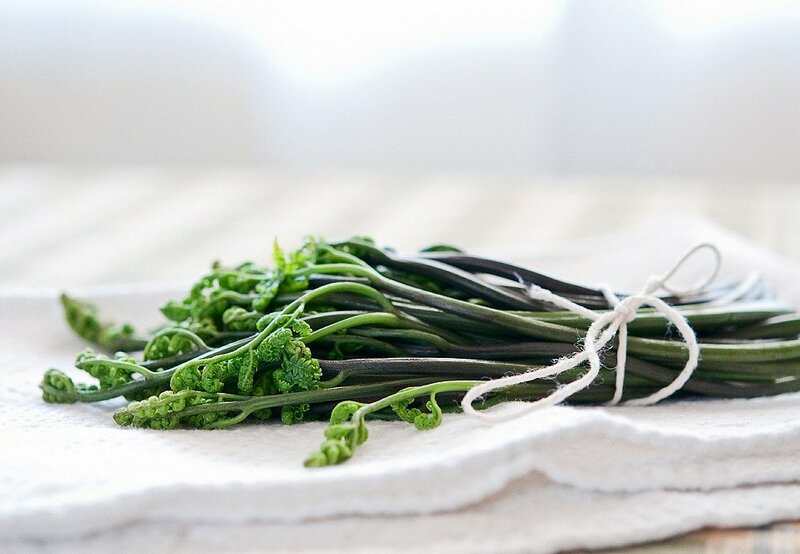 After all, you should only eat bracken a few times a year, so enjoy it! Trim the bracken fiddleheads to an even length. Bring a large pot of water to a boil and add enough salt to make it taste like the sea. Fill a large bowl with ice water. Boil the bracken for 2 minutes, then plunge into the ice water. let them sit in the water for 45 minutes to 1 hour. Discard the water. Pat dry. Heat half the truffle butter in a large saute pan over medium-high heat. Saute the fiddleheads for 4 to 5 minutes, flipping them from time to time. Sprinkle some salt over them. Turn off the heat and add the remaining butter. Swirl to coat the fiddleheads with the butter as it melts. Eat at once. Well, I’m trying bracken fiddleheads for lunch today, don’t have any truffle butter so going to use garlic butter, I’ve spent over $10,000 over the last 30 years trying to get rid of bracken fern on my farm as it kills my cows if they eat to much of it, so I’m delighted to find that I can actually eat the stuff, thank you for all your information on the bracken fern, best I’ve found so far. Brenda: Where are you? Australia? Bracken is not edible in the Northern Hemisphere right now. It’s only edible as a young fiddlehead. It’s not bibimbap without gosari! I have it dried on hand all the time, but I’m thinking about growing some for fun. I don’t make bibimbap often – I live alone and it’s a hassle to come up with all the right ingredients at he same time. But the bracken fern is what makes it classic. Great article, thanks! Great article. Just not confident to pick them myself. They eat this widely in Malaysia, everyday, everywhere. Not sure if throat and stomach cancers rate are high; would it be a different variety of fern?